12 in.24 in.48 in.60 in.72 in. Very low frequency equipment test lead cable assembly PE34534-36 from Pasternack is manufactured to a high standard of quality. This Pasternack RF test lead is built with a BNC cable connector on side 1. Our BNC test lead assembly has a alligator connector on side 2. BNC to BNC RF test equipment lead cable is manufactured with male gender for side 1 and clip for side 2. BNC male to alligator clip cable test lead for RF is constructed with RG400 cable and the impedance is 50 Ohm. 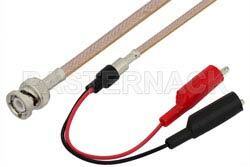 PE34534-36 BNC male to alligator clip test equipment lead using RG400 cable has a 36 inch length.